Following an alleged ‘secretive, high-handed’ decision by the Central Pollution Control Board (CPCB), Bhopal’s toxic waste is now heading towards Mumbai. According to sources, the CPCB is surreptitiously trying to dispose of the pollutants in the premises of a waste management company in Taloja, Navi Mumbai, but the area gram panchayats have come together in stiff opposition against the move. 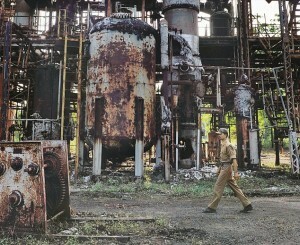 Nearly 346 tonnes of hazardous waste from the Bhopal gas tragedy site is awaiting disposal for the past 27 years. 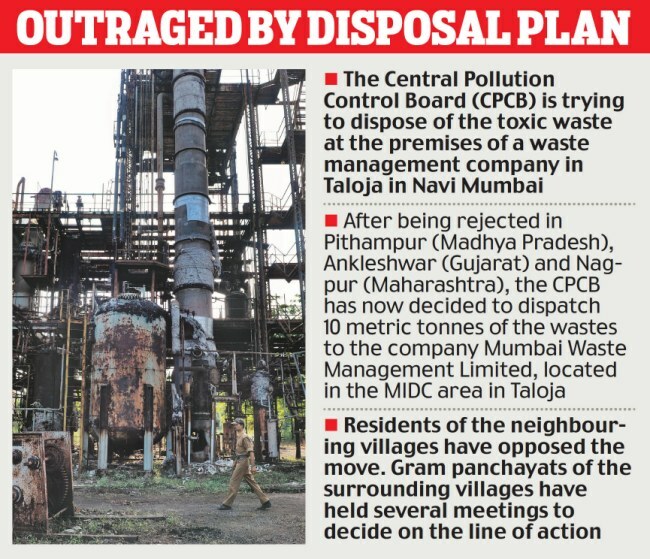 According to sources, after being rejected in Pithampur (Madhya Pradesh), Ankleshwar (Gujarat) and Nagpur (Maharashtra), the CPCB has now decided to despatch 10 metric tonnes of the toxic waste to the Mumbai Waste Management Limited in the MIDC area of Taloja. The waste will be burnt in the company’s compound. But as soon as the news broke out, the residents of neighbouring villages came together to oppose the move. The gram panchayats of Ghot, Nitlas, Siddhi Karvale, Koynavele and Tonder – which are located around the company’s premises – held joint meetings to decide the course of action. They also took up the matter with the local environment authorities. Environment activists, who have consistently opposed the toxic waste disposal in any location with human population, are angry with the CPCB decision. ‘The waste from Bhopal includes the hazardous halogen nitrate compound and chlorinated organic chain. ‘Burning it could result in poisonous dioxine fumes that can result in cancer and deformities in future generations, besides respiratory and nervous disorders,’ an expert said. On three previous occasions, the CPCB had tried to dispose of the waste in Pithampur in Madhya Pradesh, Ankleshwar in Gujarat and Nagpur in Maharashtra. However, environmental activists and local residents have put paid to the CPCB’s attempts, citing the hazards of these toxic substances. In 2008, while Indore was under curfew following communal riots, the state government had smuggled out 40 tonnes of toxic waste from the Union Carbide factory to an incinerator in Pithampur, 230 km away. In 2010, after visiting the TSD (treatment, storage and disposal) incinerator facility in Pithampur, Dhar district, environment minister Jairam Ramesh had apologised to the people for the government’s action and termed it ‘wrong’. In May 2011, Ramesh said the DRDO could ‘easily destroy’ the waste material without posing any threat to the environment. On July 12 the same year, the Jabalpur High Court had directed 350 tonnes of the waste to be incinerated at a DRDO facility 30 km from Nagpur. The Vidarbha Environmental Action Group (VEAG) had to move the Nagpur bench of the Bombay High Court for a ban on the Jabalpur High Court’s decision. The Nagpur bench stayed the entry of 346 MT of toxic waste from the Union Carbide factory site to Nagpur and directed the state government, the Maharashtra Pollution Control Board (MPCB) and the petitioners to file an intervention petition at the Jabalpur bench. The MPCB then refused the toxic waste that was to be brought to the DRDO facility, saying it had not been functional for over two years and was illequipped to destroy the waste. The poisonous chemical waste is still potent to cause a series of serious, even fatal, ailments.